Permit is for a Conditional Permit for one level underground parking garage shell only for a new 11 storey mixed use building including site servicing and underslab plumbing. One of the demolition permits was filed by SRM Architects so I assume that they were involved with the project's design. It’s no wonder people are often confused about streets going east or west / north or south. There’s a lovely sign on Frederick Street advising drivers that Weber southbound is closed at Cameron. Weber runs east and west. If the city can’t figure this out what are we supposed to do? (12-08-2018, 07:33 PM)jgsz Wrote: It’s no wonder people are often confused about streets going east or west / north or south. Does Weber actually run east/west tho? So many drivers rely on GPS and when travelling eastward, for example, Weber will show N<-- if you were to turn left, and S<-- if you were to turn right. Village planners back in the 1800's got it all wrong and nothing was every fixed. Depending on the section, it runs between WNW and NNW. Marking it N/S instead of W/E wouldn't be perfect, either. And renaming all the street directions would be a massive project with little benefit. That's the thing I've always found ironic, it's annoying because we're always like, is it southbound or eastbound or what? But it's really neither. It would be less confusing if the sign just said Weber Street East closed at Cameron. By the way, this time of year, the sun actually rises on King Street East. (12-09-2018, 07:32 AM)Spokes Wrote: That's the thing I've always found ironic, it's annoying because we're always like, is it southbound or eastbound or what? But it's really neither. Right. So I use the official directions. It's not significantly more "wrong" or "right" but at least then I'm indicating what's shown on the street signs. That is definitely the correct thing to do. This is one of those “wouldn’t it be great if…” scenarios, as in “wouldn’t it be great if there was somebody who could decide which direction names to use for our streets, and publish it in some sort of document so we could follow it and be sure that we mean the same thing as other people do when they use the same words”. Some problems exist mostly because people refuse the use the existing, already near-optimal, solutions. This is also why sometimes highway signs will say things like “Highway 5 South, 6 North”. It’s unusual but not unprecedented for opposite directions of two different highways to share the same direction of a common road segment. It's been a little while since I've gone by that corner, but I think they finally started construction on that Tim Horton's that has been planned for the corner of Frederick/Edna for the past five years or so. (12-18-2018, 10:58 AM)jamincan Wrote: It's been a little while since I've gone by that corner, but I think they finally started construction on that Tim Horton's that has been planned for the corner of Frederick/Edna for the past five years or so. It's been going up fast, all framed and closed in last time I looked. Assume once the interior is done they'll finish the exterior. Curious what they plan to do with entrance/exit for the drive-thru (would they use existing mall parking lot entrances or have dedicated ones)? It depends on who you ask, the City of Kitchener uses an East/West grid, but the Region uses a North/South grid. So the City says east west, and the region says north south. (And Weber is a regional road in the city of Kitchener, so neither are wrong, and neither are right). This is why the words north, east, south, and west, are verboten in the Region of Waterloo. (12-08-2018, 08:41 PM)jeffster Wrote: Does Weber actually run east/west tho? So many drivers rely on GPS and when travelling eastward, for example, Weber will show N<-- if you were to turn left, and S<-- if you were to turn right. Village planners back in the 1800's got it all wrong and nothing was every fixed. Umm, I hadn’t actually thought about this before, but Google Maps seems to think that Weber has N, S, W, and E segments, just like King St. Shouldn’t everything use those directions? The Region’s policy should be to work with the constituent municipalities to agree, and unless we renumber King and Weber to run N/S from the K-W border (nightmare), I don’t see how the current system can be changed. 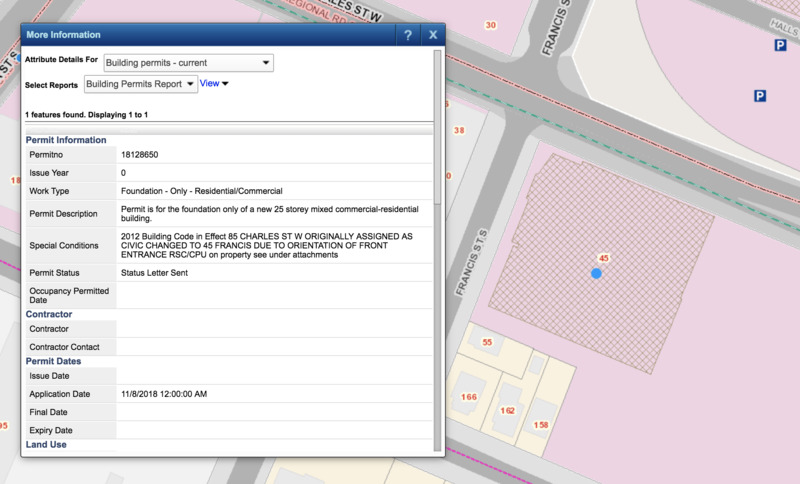 Does anyone wiser than me know how to get some more information for building permits out of GIS / the city website? For example, I know that the crosshatched shape here (Arrow Lofts Phase II) means that plans were submitted and approved, presumably reviewed in detail at a planning & works (?) meeting of some sort. 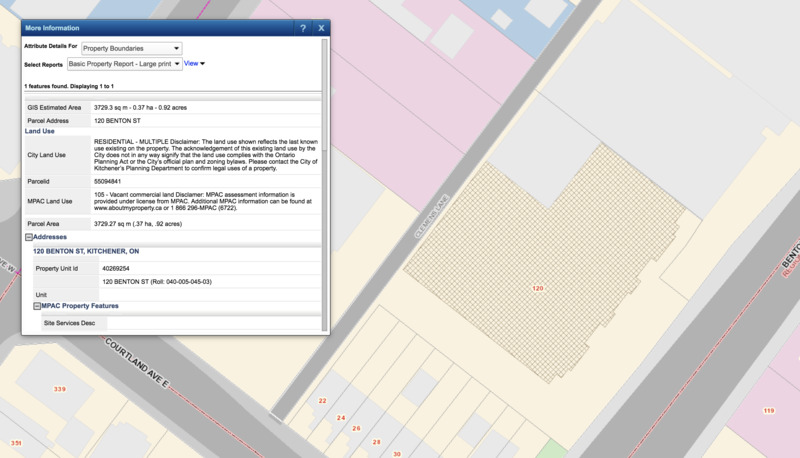 For other buildings I've been able to find site plans, etc. How do I track those down for this building? Seems like the manulife parking lot building could be coming sooner than we thought?